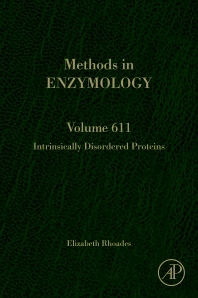 Intrinsically Disordered Proteins, Volume 611, the latest release in the Methods in Enzymology series, highlights new advances in the field, with this new volume presenting interesting chapters on topics of interest, including the Characterization of Structure-Function relationships in the intrinsically disordered protein complexin, Distances, distance distributions, and ensembles of IDPs from single-molecule FRET, Biophysical characterization of disordered protein liquid phases, The Use of Mass Spectrometry to Examine IDPs – Unique Insights and Caveats, Fluorescence Depolarization Kinetics to Study Conformational Preference, Structural Plasticity and Membrane Binding of Intrinsically Disordered Proteins, Characterizing the Function of Intrinsically Disordered Proteins in the Circadian Clock, and more. Basic research scientists – biophysicists, biochemists, and biologists – who are studying systems where protein disorder is important to function or dysfunction. Elizabeth Rhoades was born and raised in Huntsville, Alabama. As a child, she loved reading and when she left for college, she intended to major in English at Duke University. After taking a Physics course to fulfill a distribution requirement during her first year, she switched gears and decided to pursue a Physics major. In between her junior and senior years, she spent a summer at the University of Tennessee in a REU program, where she discovered biophysics. Liz earned her Ph.D. in 2001 from the Biophysics Research Division at the University of Michigan, working with Ari Gafni, a biophysical chemist, and Ducan Steel, a physicist, on understanding amyloid aggregation. It was in the Gafni-Steel lab that she became interested in understanding the physico-chemical basis of protein structure and dynamics and the power of fluorescence spectroscopy as a tool. She spent 2.5 years as a postdoctoral fellow with Gilad Haran at the Weizmann Institute, applying single molecule fluorescence to the study of protein folding, and then an additional 2.5 years as a postdoc in Watt Webb’s lab at Cornell University. In 2006, Liz joined the faculty in the Molecular Biophysics & Biochemistry Department at Yale University, where she rose through the academic ranks. She moved to the Chemistry Department at the University of Pennsylvania in 2016. In her independent career, her research focuses on understanding both functional and dysfunctional aspects of intrinsically disordered proteins, with a focus on several implicated in neurodegeneration. She has served as chair of the Intrinsically Disordered Protein Subgroup of the Biophysical Society and currently serves as Associate Editor of the Proteins section of the Biophysical Journal. Her husband is also a scientist/professor and she has two young sons who plan to be superheroes when they grow up.